This is a guest post from Aidan Kempster, creator of ridingforthegreatforest.com. 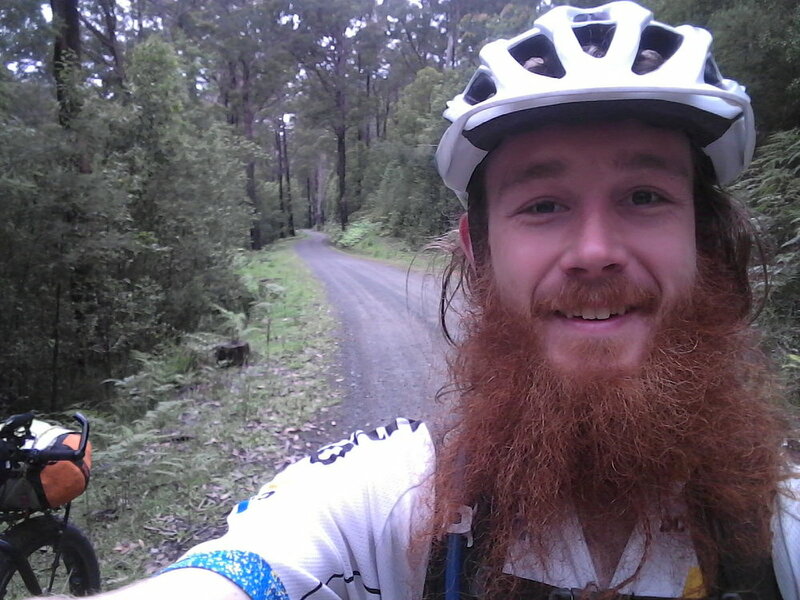 You can find other rides like this on his website, all off-road adventures in the great forests north-east of Melbourne. Where: Bunyip State Park, Yarra Ranges, Yarra Valley. This ride takes in much of the area of the proposed Great Forest National Park. Surface: almost entirely unsealed. Rough sections. Mountain bike or big-tyred gravel-type bike recommended. The author tackled it on a fat bike. A short stretch of busy highway (Princes HWY/C101) takes you out of Pakenham to Dore Rd. From here there are no more supply points until Warburton, over 120km away. 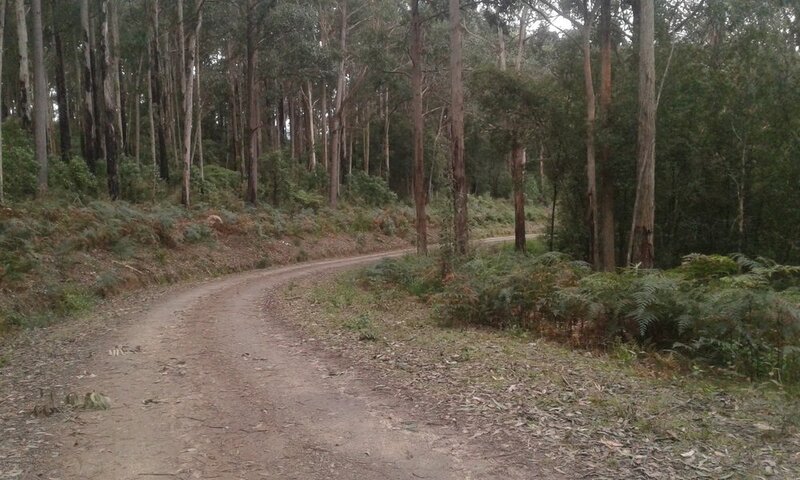 The ride from the highway to Bunyip State Park is well-groomed grinding on quiet roads. The southern half of Bunyip is mostly off-limits to vehicles, so this means you'll have to lift your bike over a couple of barriers. Make sure you stop at the Four Brothers Rocks and see if you can spot Seven Acre Rock across the valley. The first free camp is at the bottom of the valley at Nash Creek, and has toilets and fire pits. From the campsite you are back on public roads. At the 44km mark you have a choice between the western approach (used on the map), and Tea Tree Road. If you are travelling in winter or have a heavy bike, you may want to divert from the listed route and take Tea Tree Road and then climb the ridge via Forest Road, which has a gentler grade and surface than the western approach. You will rejoin the route at the 54.2km mark. Lots of gravel from the top edge of Bunyip to the Ada Tree manifesting a good mix of flowing downhill and scenic grinding. You will pass by a few large logging coupes. See if you can notice how different the air and ground feels in these sections compared to the areas with thick canopy. I cannot recommend the Ada Tall Trees walk enough. Your legs may be burning, you may be craving sleep, but get off the bike for a little bit and walk into ancient cool temperate rainforest. 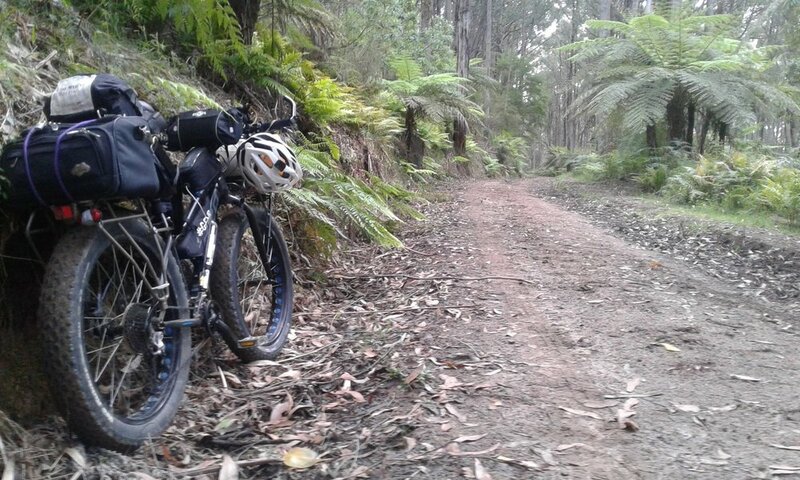 There's only 12km of flat gravel between the Ada Tall Trees reserve and Starling's Gap campsite. Starling's Gap can be cold and wet, as it's at some altitude, but it's a beautiful campsite. From here it's smooth sailing back to Lilydale. There's 10km of downhill before 5km of sealed road back to Warburton, where you can get hot food, groceries and a bed. The final 40km along the Warby Trail is scenic, car-free and an excellent way to warm down those tired legs. The Ada Tree is one of the largest known specimens of Mountain Ash (Eucalyptus Regnans) on the mainland of Australia and predates European colonisation of the continent. Best ridden during the warmer months between the Melbourne Cup and Queen’s Birthday public holidays. The Western approach to Gentle Annie is closed during winter and it is necessary to climb the ridge via Forest Rd (a gentle alternative). It will also be very cold at Starling’s Gap over winter and there may be snow on extreme weather days. The starting point is Pakenham station and the end point is Lilydale station. Both are part of the Melbourne Metro train system. Check out this blog post about using Victoria's public transport system with your bike. Download GPX Track or KML file of this route. Please note that as this ride traverses many little-used tracks, there may be some inaccuracies in these files. Do not solely rely on them for navigation. Yarra Valley – West Gippsland Rooftop Map covers the region and the reverse side has a detailed Gembrooke Noojee Forest Activities Map which is also useful for this route. “Fat Weekender” – a pedal by pedal account of what is 90% the same route. Surface: everything from sealed road to rocky/muddy tracks. Rough and steep sections. Can be done on a gravel-type bike, though some may prefer a MTB. Wide tyres will help.